A thrilling adventure back in time to discover the Mayan civilization in one of the most beautiful archaeological sites in Mexico followed by a dip in the turquoise Caribbean Sea surrounded by cliffs and ancient ruins. We go to the pier where we take the ferry to Playa del Carmen, on the Yucatán coast, in the heart of the famous Riviera Maya. 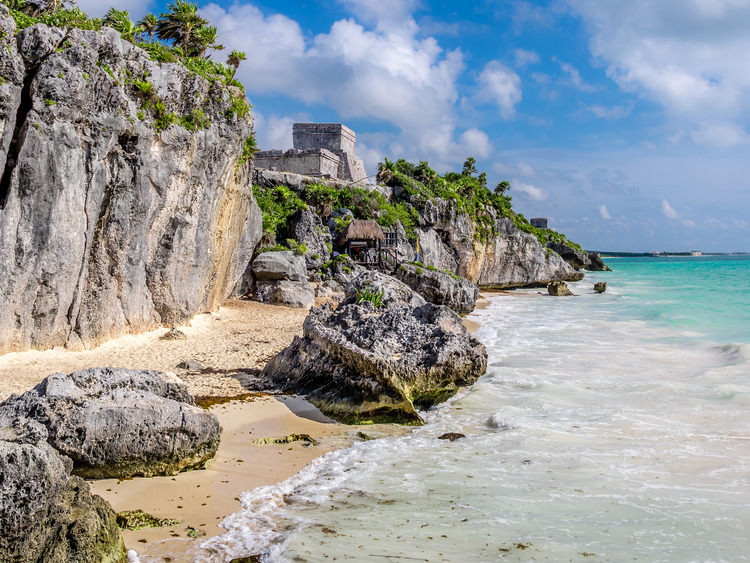 From here, a fully air-conditioned coach takes us to the ancient Tulum ruins, perched on a rocky cliff with the Caribbean Sea on one side and luxuriant jungle on the other. Once there, our guide takes us on a 50 minute trek to discover this 13th-century stronghold, the only Mayan city built by the sea and one of the few surrounded by walls. We visit its majestic structures, the most representative of which is certainly El Castillo, the tallest building facing the sea and used as a lighthouse and watchtower. It offers magnificent views and the sea breeze invigorates us after the climb up its steep steps. We enter the Temple of the Frescoes, one of the best preserved buildings famous for its Mayan bas-reliefs figures, incisions and murals, arranged on three levels and symbolising the three realms of the Mayan universe: the world of the dead at the bottom, the middle level of the living and the realm of the gods at the top. At the end of our guided tour, we have two hours to wander around the site and take a few pictures. Just below the cliff where the ruins are located, there is an amazing white beach lapped by crystal-clear waters where we can go for a dip or sunbathe while enjoying a light snack and a bottle of water or soda (included in the excursion). The ferry transfer from Cozumel to Playa del Carmen takes approximately 45 minutes each way. The coach transfer from Playa del Carmen to Tulum takes approximately 45 minutes each way and the road may include uneven stretches. You must pay a tax (approx. 5 U$D) upon entry to use your camera within the archaeological site. We recommend you wear comfortable shoes as we will be walking on rough ground during the visit to the archaeological site. This excursion is not recommended for guests with mobility problems and those who suffer from sea sickness as we will be taking a ferry to Playa del Carmen and the sea may be rough. Those who deem it necessary may take sea sickness tablets before setting off on the excursion. Participants must hold onto and are responsible, for the entire duration of the excursion, for valuables, cameras, handbags and other personal belongings. Costa Cruises and the Tour Operator are not responsible for any loss, theft or damage during the on-land excursions. Subsequent to purchasing tickets, gift certificates and vouchers, refunds are not provided. No exceptions will be considered as agreements with agents at every individual port are stipulated prior to the arrival of the ship. Excursion departure times and duration are subject to modification without prior warning depending on external circumstances, adverse weather conditions and/or transportation delays. The itinerary may be subject to change depending on adverse weather conditions and/or traffic conditions. Passengers are asked to respect the times provided by the Guide (stops for food, stops for photos, etc.). The descriptions are updated on the date of publication of materials.